He examined the page. It was only at some length and challenge he arrived here. There were the hours of examination, application, and exposition. All of it mattered little. There was nothing. It was a great void where he expected definition. He stared. What adventures this page wrought, and further journeys it foretold. Yet, here, in this place, there was only emptiness…and urgency. The clock continued its course even as the puzzle before him revealed nothing. Uneasiness clouded his mind, a slow rising, a light burn of exasperation. Had he not worked for this moment? Did it not deserve something? Yet, still, there was only a blank. Tick-tock-tick. He looked around the room for answers. There was a map and photos from distant places. Was there a code? He swiveled. He saw books: stories of exploration, of war, and of warnings. Tick-tick-tick. “An oasis in a desert?” he thought, briefly acknowledging a photo. It suggested little. He noted the fascination with ancient mystery. What did it tell him? Nothing; there was nothing here. Everything in his life led to this barren place. Tock-tick. A cry of frustration, perhaps despair, rang through the hall. Tension gripped him. “Well,” he thought, “I’m not alone.” He considered whether to investigate, then the cry became a squeal and little else was heard. Tick-tock. He looked again at the page. It seemed an impenetrable vacancy. Tock. A word came to mind and his shoulders sagged. It wasn’t the stress of an unfathomable burden, but, rather, a bit of clarity through the fog. The word was no mystery and it held enormous consequences. Tick. He learned some time ago to trust these moments of intuition. Still, another part of his mind pleaded the clock’s case. Tock. A deep breath allowed him to quiet the voice and focus on the previous insight. “Manufactured” was the word. What did it mean? He glanced at the page again and found it populated with intent. The intent, of course, was a bit of suspense. That’s part of my job and the “fear” created above was something akin to writer’s block, though mercifully short lived. There are many different directions the story can go. Part of the inspiration was the thought of an investigator or adventurer reaching his or her goal and finding nothing. The writing is an end, at least in many cases. It is the last part of a process of inspiration, research, preparation, and visualization. I sometimes have the privilege of being in the room with many aspiring authors and the final part is always the writing. It’s the intimidating blank page that creates a weight, certainly a fear in some. There are many great story ideas out there, but even with the vast number of self-published e-books, a good number of the stories are never written. In longer forms of writing it’s often a fifth or sixth draft that is (at long last) released. The most revision an author mentioned to me was nine drafts. Even with so much revision there are always new ideas, mistakes, and extraneous words, sentences, paragraphs, and even unnecessary chapters. Everything is a work in progress, particularly our thoughts and convictions. The first effort of any writing is just to get the ideas down. First drafts do not pass muster. By the time you reach a final draft there should be few unaltered words, and this includes editing as you write. Don’t worry too much about the quality of your first draft. It’s the ideas that matter. The lesson learned, not long ago, was this: every fear is manufactured. I didn’t write books in my 20’s, and managed just two at the end of my 30’s. Three years into my 40’s I’m working on my twelfth and thirteenth for two different series, and researching number fourteen. I manufacture fear in the mystery series, only able to do it because of diminishing my own fear. But all that is a little touchy-feely, though I did consider making it the focus of this post. Instead, let’s look briefly at the first section and break down a method of creating fear for narrative purposes. First, the reader is placed in a fairly mundane position: looking at a page of paper, then told that this simple act was the result of great effort, reinforced through the description “hours of…” The effort, however, is insignificant: a sense of loss is presented, using little, nothing, and void to reinforce the feeling. The second paragraph reinforces the sense of loss and creates new tension in the guise of a deadline. “Uneasiness” and “exasperation” reinforce the character’s emotional state. The real question is whether it is shared by the reader. The first paragraph briefly described efforts that could be just about anything, including college courses. Here, the hard work is re-emphasized and, hopefully, the reader draws on his or her own experience to empathize with the character. Finally, I get a little gimmicky with the imagined ticking of a clock. It’s meant to build more tension. It’s a short paragraph, but five complete sentences. The quick chops here push the pace. I’m not a fan of long descriptive sentences, particularly those that start with dependent clauses. I taught English in a private school for some years and that was precisely the method other teachers espoused for ‘artful’ writing. It usually sounds to me like the author wants to impress himself/herself and doesn’t consider the reader at all. That said, if you write for critical approval, those are the type of sentences needed. An example: “Stopping to examine the hall, a tremulous feeling began as a buzz in the back of her uneasy brain as she felt the ancient weight of the ages in the dank and dusty walls.” It’s a short example, but plenty wordy. Critics love it. So, include plenty of this crud, add angst, stir and there is your recipe for good reviews. Likable characters aren’t needed, just the angst and wordiness. You may not even have to pay for your Kirkus Review. The paragraph describes my office. There is a map, some travel photos, and plenty of clutter as well. The observation of seemingly significant information that is of no help adds to the frustration/tension. That’s the intent. “Nothing” and “barren” continue to build the sense of loss or helplessness. The rush of time continues to be highlighted with the “tick-tock” gimmick. I reduce the number of ticks and tocks as the story continues to give a sense of time running out. That’s probably enough to get the picture. There are few more things to mention, including the emotions described. I purposefully avoided the word ‘fear,’ and utilized as many synonyms of ‘empty’ as possible: nothing, void, emptiness, blank, little, barren, vacancy. The cry of despair, incidentally, was my son who (once again) wasn’t napping. He vocalized the frustration I wanted to create and seemed to settle down. He still didn’t nap. You know how it is. If it were a longer story, this part would be edited out. It’s not important, but included here to throw the reader a bit. The “oasis” is a reference to photos of the Valley of Fire (Nevada) around my desk. There is a double meaning because the character wants a lifeline and can’t find it. One additional and relevant note is this: there are no exclamation marks. Let your word choice create emphasis and urgency. Do I always follow this rule? My books are for a younger audience so word choice is sometimes limited. 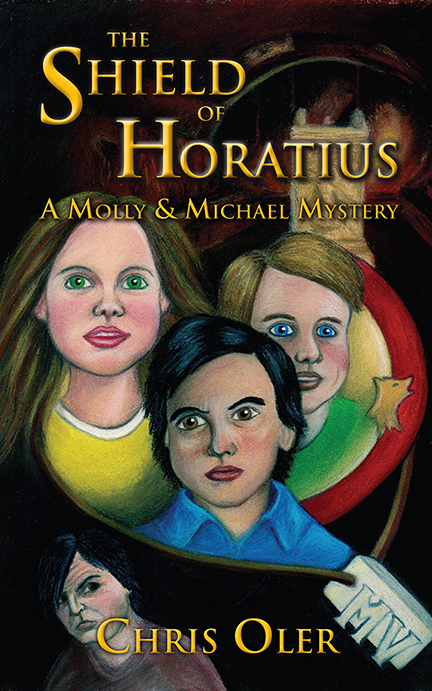 That said, the mystery The Shield of Horatius purposely stretches the young audience’s vocabulary while providing context to show the meaning of the word. In other words, the young reader won’t have to use a dictionary if they’re engaged. Created an unresolved necessity (an unknown). Enhanced the difficulty of obtaining the need. Increased the emotional tension of the character (and reader). Resolution isn’t always needed, or even desired. The story that comes to mind is Shirley Jackson’s “The Lottery” where her Step Three was to distort the recognizable situation into horror. She spends much of the story on Steps One and Two and it increases the emotional impact of the distortion. Steps Three, Four, and Five arrive suddenly before the abrupt ending. Similarly, Richard Connell’s “The Most Dangerous Game” inverts a familiar situation, but the menace is straightforward and there is resolution (without graphic description). Both of these stories are terrific–in both senses of the word–October reads. This was my take on a selected topic for another site. I hope you had fun. My wife wants me to make the story the basis for a new book, so I guess that turned out okay. Happy October reading, and thanks for taking the time!